Winter cave trip – Rockwood, originally uploaded by Mic2006. I love the underground ice formations, they are especially abundant after the type of recent freeze and thaw that we have been experiencing here in Ontario. Most of the more impressive decorations are concentrated at cave entrances. 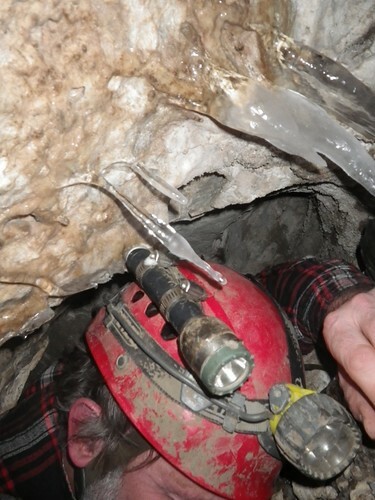 Up in Marmora the cave ice is greatly varied – in particular in the tunnels at the entrance to Spanky’s paradise. I recall beautiful crystal clear curtains that I actually wacked my helmet up against before I realized they blocked the passage. It seems that in Rockwood it is the ice stalagmites that are most common. see the video here of a short excursion that we made into the entrance of number 8 cave. See video of Rockwood cave ice formations here. We avoided the main cave as bats are sometimes known to over-winter there – the extent to which there are any surviving bats in the Rockwood Caves is questionable as they are heavily traveled and badly trashed. We did however discover a small hole with some future potential exploration – a summer trip. The amount of roof encrusted ice crystals indicated the possibility of air blowing from within. These crystals lined the roof along the passage for at least 10 feet and shortly past the entrance the air became moist and foggy.